K9 Advantix II is the best flea medicine for dogs in 2019. 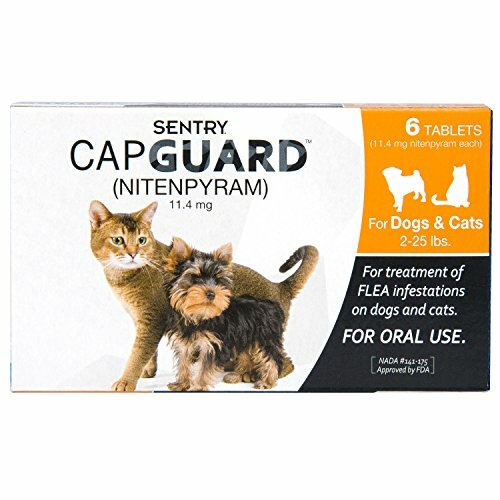 It acts quickly and is very effective in killing the fleas that infest your pup. Read more about K9 Advantix below. Fleas are a menace! As a dog owner, I can empathize with anyone who has dealt with these harmful, irritating pests. Fleas are most active in the spring and summer as they can live, thrive, and reproduce outside as well as in doors. But the cold months won’t necessarily bring relief. Fleas can thrive in the warm environment of your home and on your dogs and cats all year long. In the constant battle against fleas, dog owners have many options. There are topical treatments, oral treatments, and treatments for the environment. In this article, I focus on the best flea medicine for dogs. I’ll go over the different types of flea medicine and how you can make the right choice for you and your dog. It’s important to note that fleas have different growth stages. They begin as eggs, hatch into pupae, turn into larvae, and finally mature to adults. Some flea treatments will only kill adult fleas, some will only get rid of the eggs and some target both. There are treatments that use IGRs (insect growth regulators) to prevent fleas from maturing to the next growth stage. When choosing what flea medicine to use to treat your dog, pay attention to what the medicine does. Does it repel fleas? Does it target the eggs? Does it target the adults? You want to get the best flea medicine for your dog’s situation. There are many ways you can plan the attack on fleas in your house and on your dog. Each has benefits and drawbacks. The best thing you can do is prevent the fleas from infesting your house and your dog in the first place. Topical flea treatments include things like flea shampoos, flea powders, flea dips, and spot-on flea treatments. Flea shampoos are a great first step if you notice fleas on your dog. They work quickly to kill the fleas, but they don’t always leave enough residue to continue to kill the fleas that are hatching and maturing. You may want to use something else as well. Learn more about flea shampoos here. Flea powders for dogs last a bit longer than flea shampoos, usually about a week. They are more often made of natural ingredients rather than chemicals so they are less likely to be harmful to your dog and the rest of your household. It does mean more work for you as you’ll have to be applying the powder weekly to keep up killing those fleas. Spot-on flea treatments are the easiest to use and typically last the longest. In my opinion, they are the most popular choice as many people find them effective. You simply apply a small amount to an area on the back and let dry for several hours. Be careful not to touch this area or let it get wet until it completely dries. Otherwise, it will rub off and become ineffective as well as possibly irritating the humans it come in contact with. If you let it dry properly, it will work for about a month. These flea medicines usually contain IGRs to disrupt the flea growth cycle, not just kill the adult fleas. Spot-on flea medicine can leave an unpleasant feeling or smell. Flea dips are used on the entire dog. But be careful to avoid your dog’s eyes and ears. They also focus on residual activity--killing fleas for a long time. The best oral flea medicine acts fast and lasts for about 24 hours before it is out of your dog’s system entirely. Most of them just target adult fleas, but they will kill them fast. Some options target flea eggs, and some will kill fleas of all maturity levels. Because oral flea medicines leave your dog’s system so quickly, it’s best to use them in conjunction with another flea treatment that is preventative of future infestations. Always consult your veterinarian if you plan to combine treatments to make sure they will not react badly to one another. Some oral medications require a prescription from your veterinarian and because they are more potent, they are more likely to come with side effects. Talk to your veterinarian and monitor your dog after taking the medication. Flea collars are generally used as a preventative measure, though there are options that treat active flea infestations. They are more expensive than other treatments, but they last much longer, up to 8 months! If you compare a flea collar to a monthly spot-on treatment, remember that one flea collar lasts for the same amount of time as 8 spot-on flea treatments. Flea sprays come in a variety of choices from sprays you can use on your dog to sprays you use on surfaces in your home, to sprays for your yard. There are natural and chemical options. The natural flea sprays work well to prevent infestations and are safer to use directly on your dog. Sometimes they just repel fleas, but often they contain natural oils that kill fleas as well. The chemical flea sprays are more potent than the natural sprays. If you have an established flea infestation, a chemical flea spray will better eradicate it. The active chemical ingredients can be harmful to you and your dog, so use these only when the problem is so bad that natural sprays won’t cut it. Learn more about flea sprays here. Bombs and foggers are the strongest of the flea treatments and have the most potential to cause harm to you and your pets. I would only use these in extreme cases when all other options (flea sprays, flea medications, etc) are ineffective. Fleas infesting your home and biting you! If the fleas are able to penetrate your home and you treat your dog, the fleas will find something else to feast on: you! So it’s important to treat your dog and your home. Keep in mind that whatever treatment you use, you may continue to see fleas for a little while. Fleas have to come in contact with the medication for them to die. Only about 5% of fleas are in the adult stage. The majority are eggs, pupae, or larvae, which often aren’t killed by flea medicines. As the fleas mature, they are killed. That’s why you must be persistent. Continually treat your dog and home even after it appears all the fleas have gone. After that, use preventative measure to stop more fleas from invading your home and your dog. When giving your dog medicine, you should also consult your veterinarian, whether the medication is over the counter or prescription. This is especially important if you use multiple flea medications at the same time or if your dog is old, pregnant, nursing, or on other medications. Pay attention to the specifics of the flea medicine. Often times, flea medicine is specific to one type of pet. Be sure not to use a flea medicine that is specific to dogs on your cats. Flea medicine for dogs often contains permethrin, which is very toxic to cats. If the medication doesn’t specify that it is safe for cats, then do NOT use it on your cat. Be aware of what the medication targets. Flea medications will do some combination of killing fleas, killing ticks, and treating worms. Pick the medicine that treats your dog’s specific affliction. There have been reports of some flea medicines being ineffective in some areas. For example, I've found claims that fleas in New York are resistant to fipronil, the active ingredient in Frontline. A reader was kind enough to let me know that she has been having no luck with Advantage flea treatments in Houston, Texas. For the time-being, these reports are anecdotal. Many concerns about resistance are actually failure to properly follow the directions of the flea treatments. But we should all still keep these claims in mind. Let’s talk about what I have found to be the safest, most effective plan of attack against fleas. The first thing is prevention! If you do not have a flea problem, then you must act to prevent one from occurring. I am partial to natural methods, which are the best way to avoid long-term health problems. Choose a flea spray by reading ReadySetDog’s article on the ﻿﻿best flea sprays for dogs. And use that spray religiously around your house and on your dog (as long as it is specified as safe for use on your dog). Choose a flea-killing shampoo and give your dog a flea bath every two weeks. We have some detailed recommendations on flea shampoos here. But what if the fleas have already invaded? Is your dog itching? Are the fleas nesting in your house? Then it’s time for a spot-on treatment or oral medication to eradicate the infestation and prevent a recurrence. 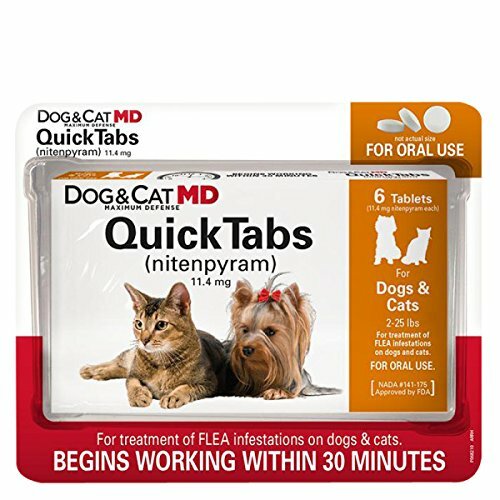 Give your dog an oral flea medication. It will act quickly to give your dog immediate relief. The less time you give those pesky fleas to bite your dog, the better. Even with the fleas gone, the existing bites are constantly irritating your dog. Below we’ll discuss the best oral flea medicines for dogs. Treat your dog with a spot-on flea medicine. Spot-on treatments will have the residual effect of killing fleas as they mature for a whole month. They also often contain IGRs to prevent fleas from ever maturing and prevent the eggs from hatching. Below we’ll discuss the best spot-on flea medicines for dogs. In conjunction with the oral and spot-on flea medicines, you must treat your house for fleas. Otherwise, they’ll start biting you! I recommend using a flea spray. Foggers and flea bombs often contain harmful chemicals so I would only use these as a last resort. As I said before, there are a few different types of flea medicines. Depending on your specific situation, one type of flea medicine might be better than another. Below, you'll find a couple lists of the best flea medicines for dogs, specifically the best oral flea medicines and the best spot-on flea medicines. K9 Advantix doesn’t mess around when it comes to treating a flea-infested dog. Their new and improved formula kills and repels fleas, ticks, lice, and mosquitoes. It includes imidacloprid, permethrin, and pyriproxyfen as active ingredients. Imidacloprid is a neuro-active pesticide that targets the fleas’ nervous systems and kills them directly. 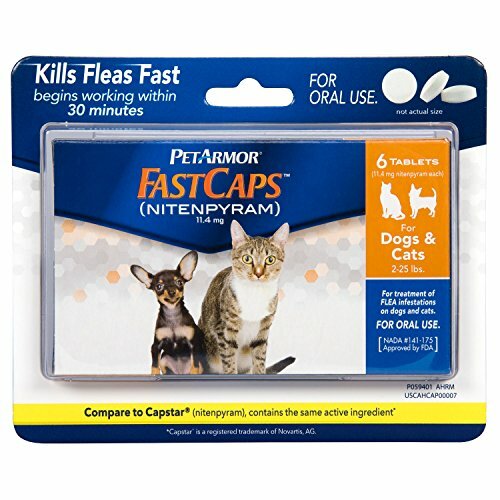 Permethrin also attacks the nervous system of fleas, but it’s important to note that it is toxic to cats so don’t use this medicine on your cats. 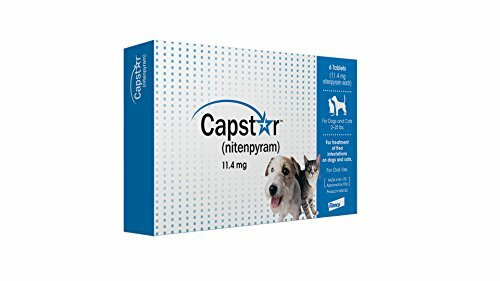 Pyriproxyfen is an IGR, which means it prevents fleas from transitioning to the next growth phase. Eggs won’t hatch into larvae, larvae won’t turn into pupae, pupae won’t turn into adults. 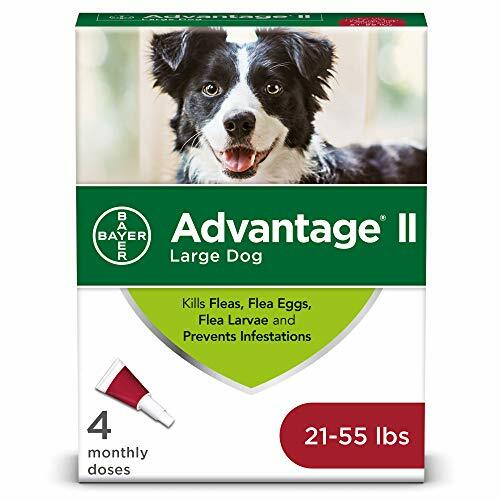 Bayer Advantage’s flea medicine formula kills fleas through contact, which means fleas don’t have to bite your pet to die. It utilizes imidacloprid and pyriproxyfen as active ingredients. The imidacloprid kills the fleas by attacking their nervous systems, while pyriproxyfen prevents them from growing up. The main difference between Bayer Advantage and K9 Advantix is that Bayer Advantage does not have permethrin. That means it’s safe to use on your cats as well as your dogs. Bayer Advantage is comparably effective in treating fleas since the imidacloprid kills the fleas in a similar way to permethrin. Vectra 3D includes dinotefuran, pyriproxyfen, and permethrin. Remember, permethrin is toxic to cats so this product is NOT safe for cats. Permethrin targets the nervous system to kill those pesky little fleas and Pyriproxyfen is an IGR that inhibits flea growth. Dinotefuran is an insecticide that also attacks the nervous system of insects. It’s more commonly used to control pests in the yard and garden. 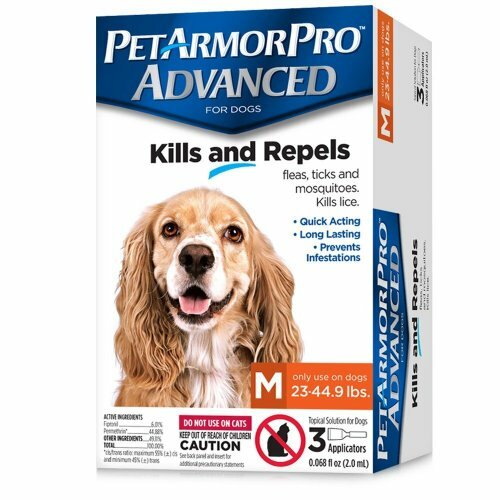 This flea medicine is able to repel and kill all sorts of insects that might bother your dog, including fleas, ticks, mosquitoes, biting and sand flies, lice and mites. Fleas are the worst! They bite your dog leaving itchy, irritated hot spots. They can spread diseases. They nibble on us humans too! And they can be very difficult to get rid of. I hope you found this article useful and informative. If your house and dog are flea-free, then start taking preventative measures now to keep them that way! If you have a flea infestation, then use the information in this article to choose your weapon and go to war! At R﻿eady﻿SetDogs, we are committed to helping you provide the best care for the furrier members of your family. If you have any questions or comments, you can leave them below or contact us.